The VistaCam 700 is a high definition 720p indoor network camera with both WIFI and wired Ethernet connectivity that can be used standalone, or with a Vera automation controller for integration in to your home automation system. 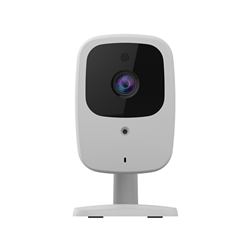 VistaCam 700 features sharp 720p resolution images, with night vision infrared illumination built-in so it can capture black & white video in pure darkness up 5m /15ft and during the day it takes full colour video. The wide angle lens captures approximately 72 degree horizontal viewing angle. The Vistacam700 has a built in microphone for audio capture.